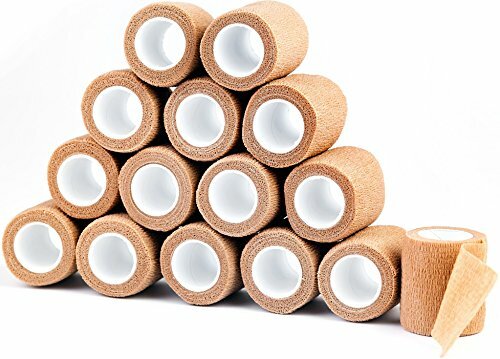 Home » First Aid » Bandages & Bandaging Supplies » Adhesive Bandages » 15 Bulk Pack Self Adherent Cohesive Wrap Bandages 2 Inches X 5 Yards, Self Adhesive Rolls FDA Approved For Swelling Sprains And Soreness On Wrist And Ankle. 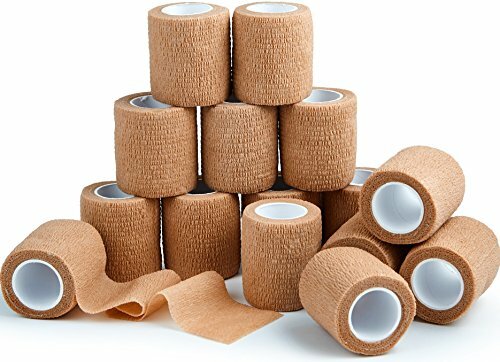 First Aid Sports Vet Tape Medical Supplies. DO YOU PLAY SPORTS? : When it comes to your care, the last thing you want is a bandage that is flimsy, poor and cheap. That’s why our professional-grade cohesive bandages are designed for maximum protection and comfort for your full recovery, every time. 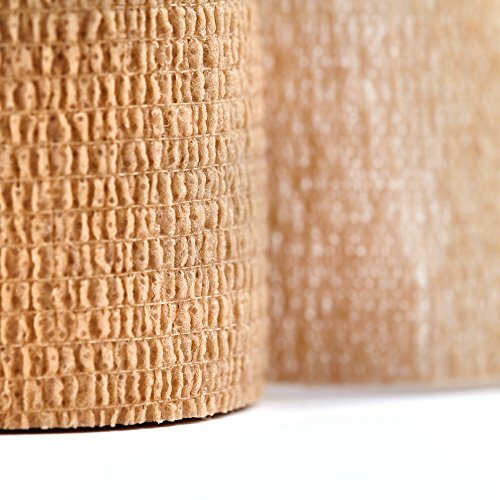 SAFE AND SIMPLE TO USE: Cohesive bandage does not stick to the skin but does stick to itself. This is handy for any tape job that involves wrapping around limbs and no fear of having any hair or skin pulled out! It can be easily torn so no need for scissors, simply tear the tape from one edge. 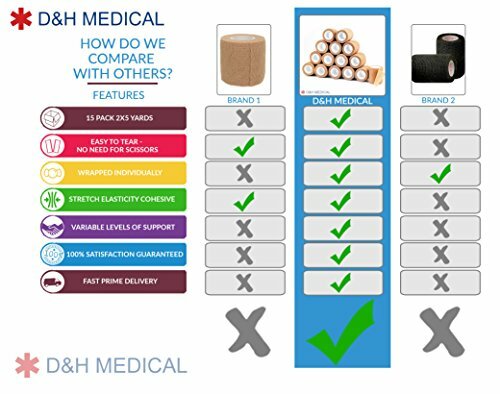 Our cohesive bandages are fully wrapped before use so you can concentrate 100% on your healing process. 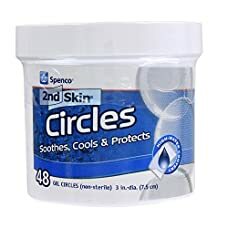 THE TRUSTED PROFESSIONAL’S CHOICE: Meticulously researched and developed by health professionals for use in the real world. 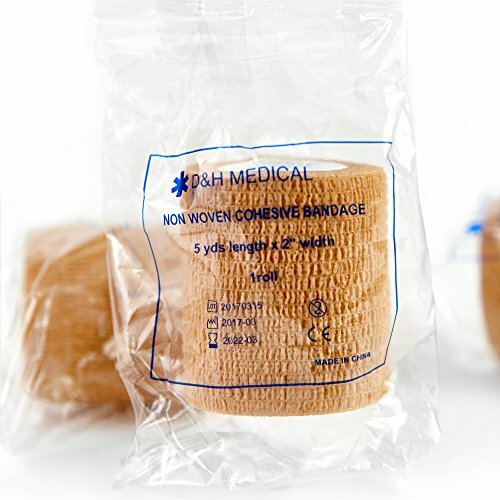 Our unique lightweight bandage is strong and durable, yet soft and easy to handle for instant practical use. YOUR SEARCH FOR THE PERFECT GAUZE BANDAGE IS OVER! Here at D&H Medical, we know all too well the issues all through recovery from surgeries and injuries. 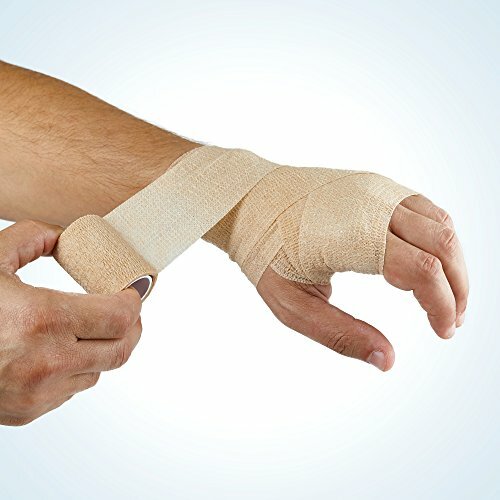 The healing process is emotionally draining and difficult enough as it is, the last thing you want is to use a cheap cohesive bandage that is not effective, immediately failing to give protection to you from weak or injured joints made of harsh, cheap fabric that causes rashes and discomfort. 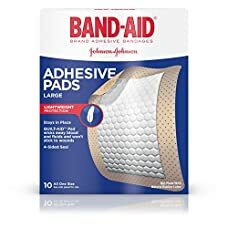 Poorly made cohesive bandage that gives inadequate pressure, non-stick and elasticity, leading to other complications ultimately working against your body’s ability to have a full and safe recovery. You can instantly feel the difference with our high-quality cohesive bandage! Each set is fully sealed for maximum protection and peace of mind. Our proprietary porous material composition, allows skin to breath for its maximum comfort and practical ease of handling for wrapping. We give a generous amount so you can freely wrap and choose the right pressure and level of beef up that’s right for you. What separates our brand from the rest? It’s simple! 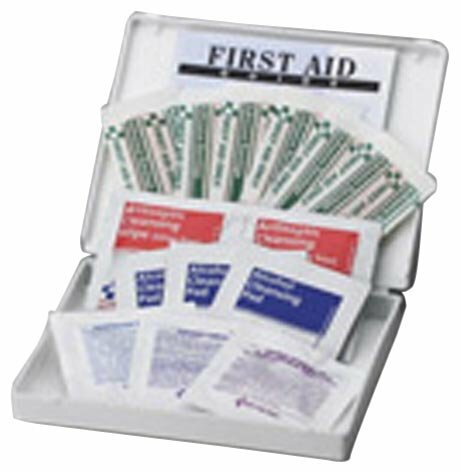 It all starts with our years of research and development to design the perfect optimum bandages for any home or health setting, with a quality standard that is unparalleled in our field. 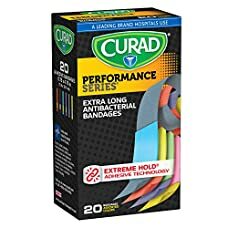 For the sake of your recovery, buy only the best bandages on Amazon – and you’re reading about it right now. And it’s on account of this that we guarantee that you’re going to be satisfied with your purchase or your full money back. DO YOU PLAY SPORTS? : In relation to your care, the last thing you want is a bandage that is flimsy, poor and cheap. That’s why our professional-grade cohesive bandages are designed for maximum protection and comfort for your full recovery, every time. EASY TO STRETCH, WRAP, TEAR: We provide 5-yard length per piece so you can use as much or as little as you want for the comfort that’s right for you. Whether in the hospital or healing at home, our cohesive bandage is water resistant will not loosen if exposed to water or sweat, made with porous material allowing the skin to breath providing more comfort. OUR QUALITY PROMISE: Buy once and buy right – don’t cut corners with your health on cheap, flimsy and unsafe alternatives. 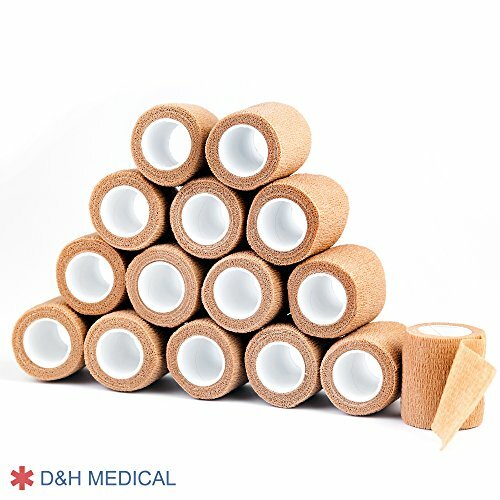 Click add to cart and get ready to enjoy total peace of mind with the best cohesive bandage for any medical situation. We guarantee you can be satisfied of your money back. No hassle, no fuss. You have our promise.